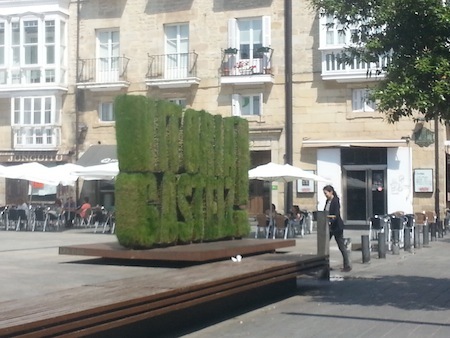 The Start of Teaching English in Vitoria-Gasteiz, Spain! 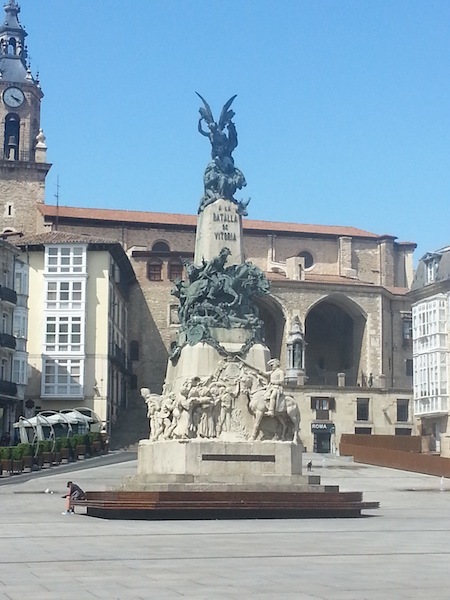 A few weeks ago, I embarked on a wonderful journey to teach English in Vitoria-Gasteiz, Spain, and one thing is for certain: it has been quite the ride! From departing Dulles International in Washington, the layover in Brussels, Belgium, and arriving in Bilbao International Airport, it has all been very exciting! My first thoughts when arriving? I'm in Spain! That, and of course, frantically, how do I get in contact with my family without an internet connection? Oh, how much we rely on technology! But that in itself is the adventure. I walked off the plane, and using my basic knowledge of the Spanish language, playing a game of Pictionary with the airport signs, and following the crowd, I eventually found baggage claim. I walked outside and within minutes, Alberto, my host dad, found me in the crowd. I'm guessing it wasn't too hard to pick out the English-speaking Asian in a crowd full of Spanish people! I hopped into his car and enjoyed conversation with Alberto and the mountainous view outside my window. What a sight it was! An hour later, I arrived at the house and one by one, I met all of five children: Andres, Tomas, Miguel, Mariana and Juan (the sixth child, Diego, is away studying in another town). What a rowdy bunch! I come to find out that it is Mariana's sixteenth birthday, and I am welcomed with tons of food and cake. After, I was invited to go to a soccer game with Andres. Vitoria's team lost 2-0, and as expected, I noticed that soccer is treated almost as highly as religion! Hours later, and after realizing the sun doesn't go down until 10:00 p.m., I went to my room, and quickly passed out. Over the next couple of days, I learned so much about my family and their traditions. Similar to America, the kids still struggle to wake up for school and, consequently, would still be eating as they rushed out the door. The difference though is that the all the kids biked to school; Vitoria was awarded the Greenest European city in 2012 for its city spanning bike baths and abundant parks and walkways. While the kids are at school, I help out my host mom Cristina with cooking and chores as well as brushing up in my Spanish. However, different from the United States, the kids come home from 1:00 to 3:00 p.m. to enjoy a family lunch and then return back to school until 5:00. As a former teacher, I find this interesting and actually prefer it; the kids have a break, are able to have a family meal, and catch up on homework. After the kids return from school at 5:00 p.m., we promptly begin English lessons for three hours, and then enjoy playing soccer in the yard before dinner. The first couple of days I explored the city as well as searched for a gym for lifting. Here in this search for the gym was the first time my Spanish was really tested since I was doing it solo. After several tries, needing to avoid the crazy high matriculation fees, I found a gym three miles away. I've made some really great friends at the gym, as they all seem really fascinated by the fact that I am from America. My usual introduction to meet people is: "Soy Americano. Lo siento porque no hablo mucho español. Tú hablas inglés?" My host family finds it really funny, but, nonetheless, it works! Well that about sums my initial thoughts here in Vitoria. Keep checking the blog for posts about my first and second weekend in Bilbao and Barcelona! Hasta luego! Jan is Teaching English in Spain as a Conversation Coach with InterExchange Working Abroad.